Regular readers will know that I grow flowers for my mother in law Joan. She’s 88 now and not able to visit as often as she would like. A posy of flowers gives Joan a flavour of what’s growing in my garden each week. As well as flowers, I take twiggy sticks with green buds, hazel “lambs tails,” and fluffy grey willow. A taste of spring. This week there’s plenty of scented Paper White Narcissi- planted in the poly tunnel at Christmas. 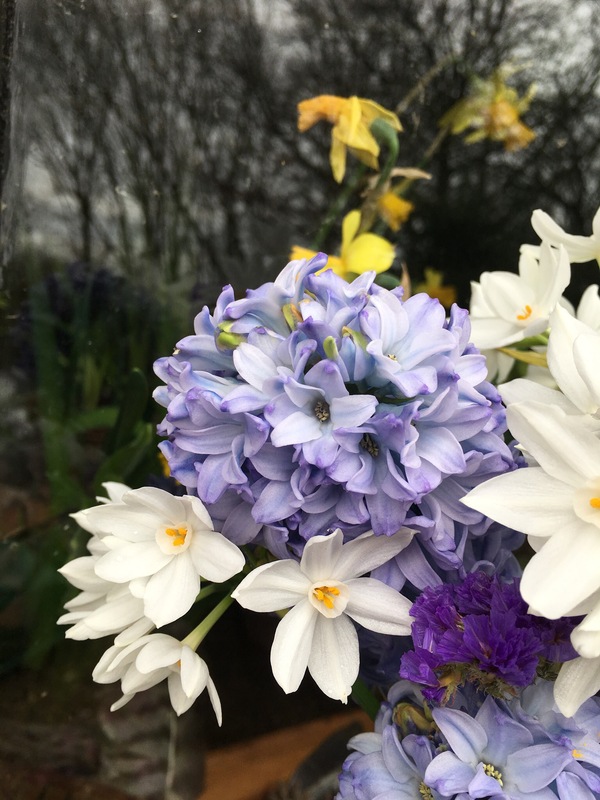 The blue and white hyacinths were planted last October and grown on in the cool dark potting shed in containers. Blue statice was grown in the veg garden last summer and hung upside down to dry in the potting shed eaves. It was the first time I’d grown statice. Choosing just the right moment to pick the flowers took a bit of practice. Some I left too late and were too far open. Others, picked on a wet day, sadly faded. 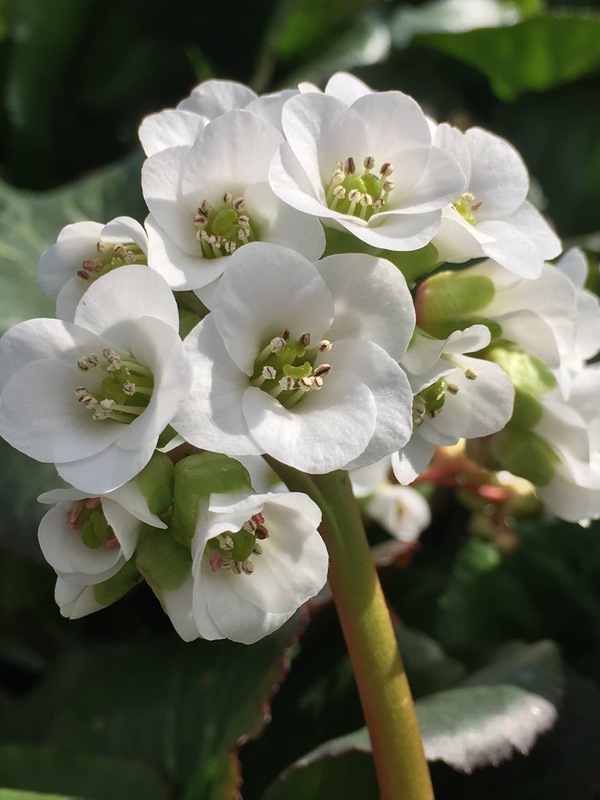 I’m also picking this white bergenia at the moment. It makes beautiful mini posies all on its own and lasts for a week in water. This variety is called Bergenia Jelle. Thanks to Cathy at Rambling in the Garden for hosting this meme. Why not go over and see what other people from all over the world are growing in their gardens right now. It’s fascinating to see the variety of plants and flowers and the different ways they are used. 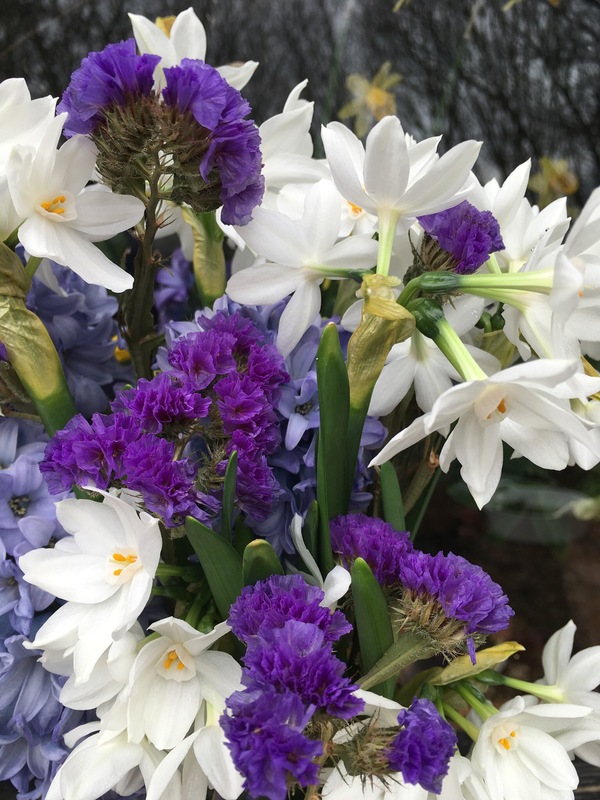 Such a gorgeous handful of beauty and scent – lucky Joan! Beautiful! Great to see flowers being that we should be deep under snow tonight! Oh.no. Not more snow! Well, spring has a habit of catching us out here too. So I’m enjoying the spring flowers, but not taking anything for granted. We have had snow in May before now. This is gorgeous. How lucky your mother-in-law is to receive such beautiful blooms regularly from your garden. Thank you. My mother in law used to love walking around my garden each week. Now she can’t travel so easily, I take my garden to her. A beautiful posy, Joan must have been thrilled to see all your spring flowers. Clever of you to mix dried and fresh flowers! Thank you Christina. The blue statice is really useful. It seems to go with so many spring flowers. Bulks out a posy when flowers are scarce. Thank you Jo. I love the statice because it can be recycled. My mother in law gives it back to me each week, and I reuse it. She also returns the string I use to tie up the posies. She’s taught me a lot about appreciating every little thing and never wasting anything. Yes she really is wonderful. When my youngest was 8 she came home from school one day to say she was going to be a reindeer in the xmas play- the next night! She had forgotten to tell me. In a panic I rang my MIL who went in the loft and found a brown all in one animal costume she had made for her son ( my husband) when he was 8! Imagine! She had kept it all those years- and knew where to find it. She’s saved me many a time! Stunning arrangement! A real snapshot of spring! Beautiful and that bergenia is tremendous. Must look out for it! Thank you. That bergenia is a miniature one, so doesn’t take up too much space. Hi Cathy. 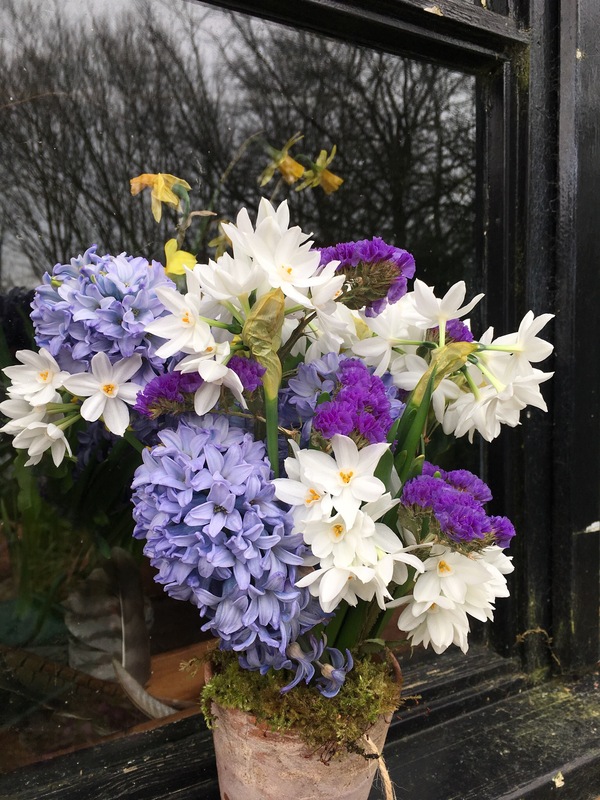 The hyacinths were watered once, put in a dark cupboard in the cold but frost free potting shed. Brought out when they were just budding. Placed in the darkish – cold potting shed. Then when they were 5″ high they were put in the un heated poly tunnel. Only brought into the house when they were fully in flower. If too warm, they bolt and grow spindly. They have been in flower for about 5 weeks now, so it’s been worth all the effort. I had about 8 pots, so it was a lot of shuffling about and remembering to do something with them all the time. I wrote it on the calendar in the end. It looks as if you and your MIL have a wonderful relationship . I like the Bergenia . Thank you Brian. Yes, I feel like she’s a second Mum to me. And she often says she’s gained a daughter. Joan is such a lucky lady, Karen, your bouquet is just adorable and very artistic.